On this date in 1842, church bells throughout Central America tolled in celebration of the death by firing squad of the great liberal statesman Francisco Morazan. Morazan monuments litter Central America. 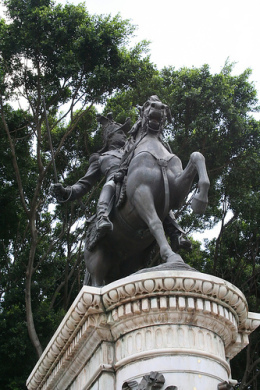 Colombian writer Gabriel Garcia Marquez once claimed (he later backed away from it) that this equestrian job in Tegucigalpa, Honduras was actually a remaindered statue of Napoleonic general Michel Ney. The self-educated soldier and politician rose to helm the short-lived Federal Republic of Central America after it broke free of Spain (and a brief hitch with Mexico) but before it splintered into Guatemala, Honduras, Nicaragua, El Salvador and Costa Rica. Anyway, the Federal Republic fell apart in the late 1830s as its constituent statelets broke apart and the familiar conservatives-landowners-priests coalition started getting the upper hand on Morazan. After an 1842 landing that briefly established him as ruler of Costa Rica (he had also had shifts as the head of state of El Salvador and of Honduras), he overreached with an announcement for universal conscription to form an army that would reunite the Central American state.